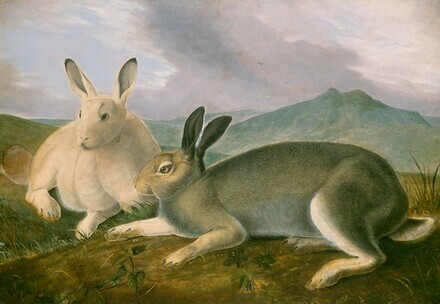 upper left in black ink: Leach; to the right of the earsof the hare, left to right respectively: 2. / 1. The artist [1785-1851]; probably by inheritance to his son, John Woodhouse Audubon [1812-1862], Salem, New York; probably John Woodhouse Audubon's second wife, Caroline Hall Audubon [1811-1899], Salem, New York; probably their son, William Bakewell Audubon [1847-1932], Australia; by inheritance to his son, Leonard Benjamin Audubon [1888-1951], Sydney, Australia; sold 1950 to E.J.L. Hallstrom [1886-1970], Sydney, Australia; gift 1951 to NGA. Audubon as an Animal Painter [Third Audubon Centennial Exhibition], National Audubon Society, New York, 1951, no. 17, as "Polar Hare" (Arctic), by John James Audubon. Audubon Paintings and Prints from the Collection of the National Gallery of Art, Washington, D.C., 1951. [John James Audubon exhibition for the benefit of the Roscoe B. Jackson Memorial Laboratory, Bar Harbor, Maine], Kennedy Galleries, New York, 1954. National Gallery Loan Exhibition, Mint Museum of Art, Charlotte, North Carolina, 1967, no. 8. Two Hundred Years of American Paintings, 1700-1900, Inaugural Exhibition, The Museum of Arts and Sciences, Macon, Georgia, 1981, no. 8. Munson-Williams-Proctor & P. Morgan Lib., AUDUBON WC & DRWGS., Utica, NY? : 1965, 89. American Paintings and Sculpture: An Illustrated Catalogue. National Gallery of Art, Washington, 1970: 10, repro. American Paintings: An Illustrated Catalogue. National Gallery of Art, Washington, 1980: 21, repro. Walker, John. National Gallery of Art, Washington. Rev. ed. New York, 1984: 394, no. 563, color repro. Boehme, Sarah E. John James Audubon in the West: The Last Expedition, Mammals of North America. New York, 2000: 160, repro.